For the latest forecast on Thursday, Feb. 21, go here. Slick roads could hamper your Thursday morning commute after a winter storm that brought snow and freezing rain to the region. A winter weather advisory remains in effect until 1 a.m. Thursday for D.C. and some parts of Virginia and Maryland, with a winter storm warning continuing until 1 a.m. for areas north and west of I-95. Storm Team4 declared a Weather Alert. In the metro D.C. area, between 2 and 4 inches of snow fell throughout the region before noon, with areas parts of Frederick County, Montgomery County and Loudoun County getting more than 6 inches. See more snow totals here. 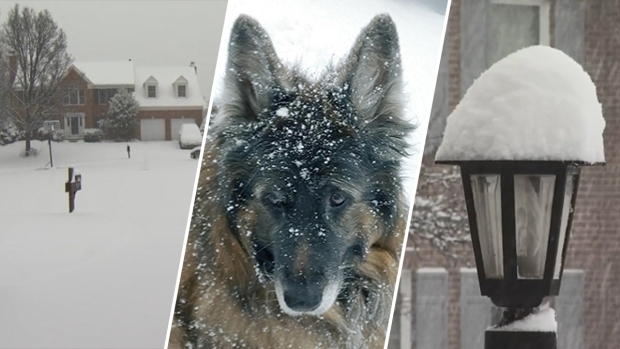 News4's Pat Collins has another Snow Stick Challenge for you ahead of the Oscars: Act out a scene from your favorite movie or dress up as your favorite movie character. From Forrest Gump to Queen Elsa, residents across the D.C. area have already submitted photos in their best costumes. Share your images by tweeting @PatsSnowStick and use #SnowStickChallenge, and you may get a Snow Stick hand-delivered by Pat Collins himself! Icy conditions on roads are expected to worsen overnight, especially north and west of the metro area, where up to a quarter inch of ice accumulation is possible - especially on higher elevations. Drivers north and west of the Beltway should prepare for a possible coating of ice. Travel along Interstate 81 could be treacherous throughout Wednesday night and well into Thursday. 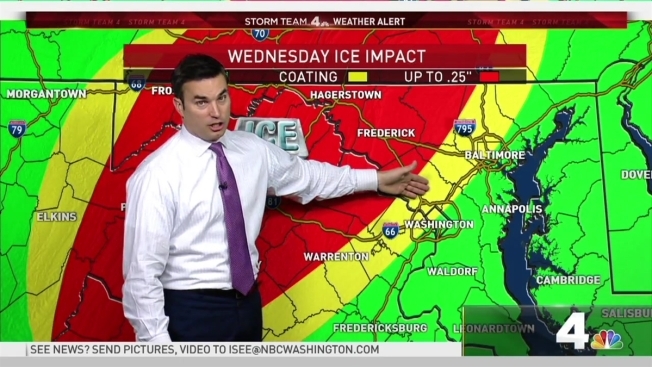 The entire D.C. area will see rain with some pockets of freezing rain ending about 1 a.m. at the latest, Storm Team4 Meteorologist Amelia Draper says. With morning temperatures starting close to or above freezing, snow from today will not melt and an icy glaze in spots will likely lead to morning delays. By Thursday afternoon, a surge of milder air will help push temperatures into the mid 40s to mid 50s, allowing for rapid melting. Federal offices in the D.C. area were closed Wednesday, although emergency and telework employees still had to report to work, the government said. Many other government offices and public schools were also closed Wednesday. News4's Pat Collins has finally gifted D.C. Mayor Muriel Bowser an official Pat Collins Snow Stick. Now, Bowser can compete in the #SnowStickChallenge. Several school systems announced they would be delayed or closed on Thursday as well. Prince George's County, Montgomery County, Alexandria City, Culpeper County, Loudoun County, Arlington, Fairfax County, Stafford County, Spotsylvania County, Howard County, Falls Church, Fredericksburg, Manassas City and Manassas Park public schools will open two hours late. Prince William County, Culpeper County and Fauquier County public schools will be closed. Go here for a full list. Transit lines cut or reduced service due to the winter weather. MARC's Penn and Camden lines are running on an "R" schedule, and there are no Brunswick line trains. VRE rail service is suspended. However, Amtrak said its Northeast Corridor service was operating normally as of early Wednesday afternoon. Metrobus routes were offering limited service on main roads only. All Metro lines and stations are open, with trains running every 12 minutes. Here's more on Metro service. Hundreds of flights were cancelled Wednesday at the D.C. area's three major airports, according to data from FlightAware.com. CORRECTION (Feb. 20, 2019, 2:06 p.m.): An earlier version of this story gave a total for rainfall instead of snowfall.